I recently got to try Fruit2O Essentials and they are delicious! I have been in love with flavored water every since I was a child. It was the only way my parents could get me to drink water because I didn't like the taste. So, I have had a lot of flavored water! Fruit2O Essentials is by far my new favorite. First of all, as I said they taste delicious. They managed to take the taste of a delicious, ripe fruit..magnify the taste..and then bottle it. Fruit2O Essentials taste better than the original fruits do! That isn't even the best part. These yummy drinks all have ZERO CALORIES! They are also packed with enough nutrients to equal 2 servings of fruit. Wow! I had to restrain myself not to drink all 6 at once! The Cherry Acai was my favorite flavor followed by the Blueberry Pomegranate. The only flavor that I didn't like was the Peach Mango and I think that was just because I don't personally like Peach. The other 5 were delicious. I was also amazed because my husband stole the Citrus one shortly after I opened it. My husband normally won't drink or eat anything that is clear with flavor (don't ask). It is also hard for me to get him to eat enough fruit. So, I will be buying these for both of us in the future. One last thing I have to tell you guys about is the packaging. When I received my Fruit2O Essentials it was packaged like fruit! I took some pictures for you all to see. Disclaimer: I received the products listed in exchange for this review. I was not compensated in any other way and these are my own honest thoughts and opinions. The top picture is from Fruit2O.com, the rest of the pictures are taken by me. Fruit2O has graciously offered to give one winner a bottle of each flavor to try! If you don't want to wait go to the Fruit2O website to print off a coupon for $1.00 off 2 18oz. bottles. 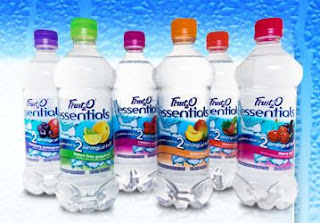 "@Latsyrc728 Thrifty and Frugal Living has a Fruit2O Essentials Giveaway (02/17) http://goo.gl/fb/LA2B #contest #giveaway"
I want to try the Blueberry Pomegranate! Sounds yummy! It's a tie between the Blueberry Pomegranate and Peach Mango! Count me in. love to try their cherry acai! The Strawberry Kiwi sounds yummy! the peach mango for me!